Artist Juleen Stacy is exhibiting her paintings at the Thom Hindle Gallery at the Keefe House, 15 Summer St., Dover, NH, through the months of June and July. She worked as an event coordinator in DC for several years putting her creativity into lively events for the corporate and private sector. She finally returned to her first love, painting, just a few years ago. 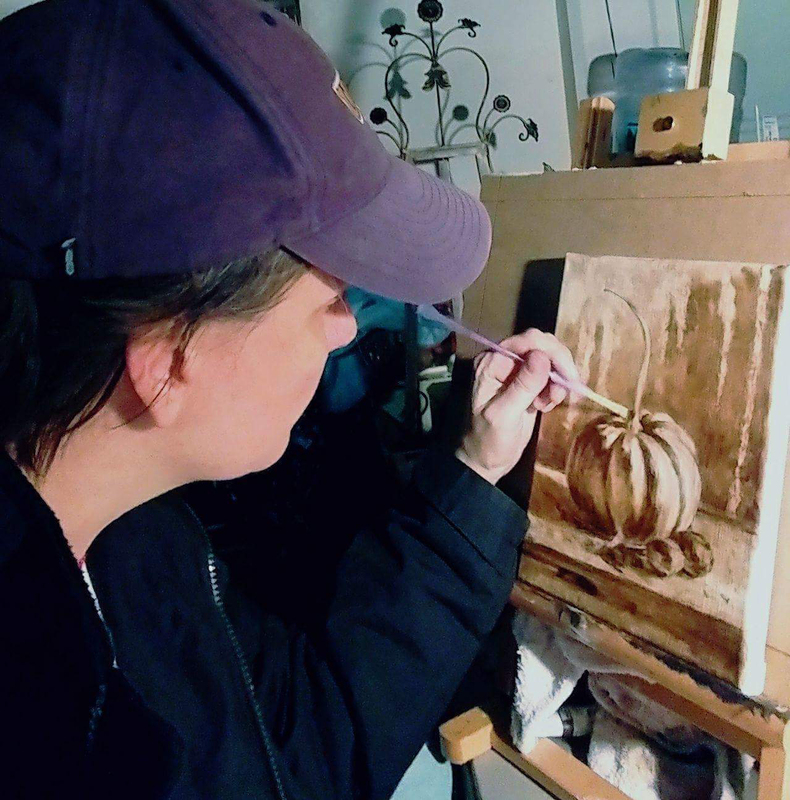 She started out painting strictly botanical art but has since branched out to include a variety of still-life subjects. Her work is produced using oil, acrylic, gouache (opaque watercolor), watercolor, pencil, encaustic, silverpoint and charcoal. Juleen is a resident at the The Art Center. More information can be found here. Also on display are the works of painter Jim Reagan. Reagan, a painter who paints outdoors whenever possible, is all about sunshine and light. 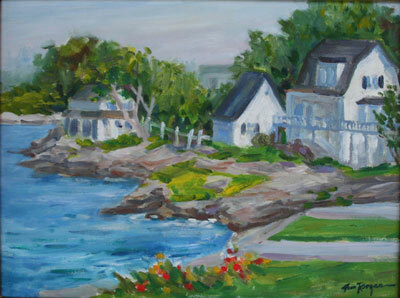 Primarily a landscape artist, he chooses the rugged seacoast of the New England coast and pastoral calm of the land. Still, his work isn’t limited to New England scenes alone – his travels also come to life in many of his watercolor collages. 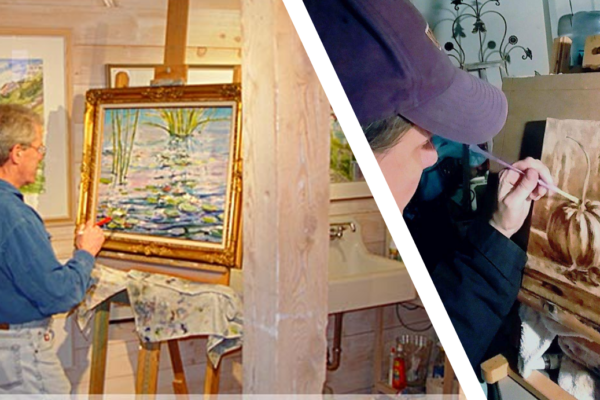 Jim studied art at Bowling Green State University, graduating with a b.s.in art education, After leaving teaching Jim coupled painting with a life in the airline industry as a flight attendant thus giving him blocks of time to devote to artistic development. To learn more about Jim Reagan, please visit his website here. The Keefe House was built in 1825 for Asa Tufts, owner of Tufts Apothecary. In 1847, his son Charles took over the shop as Asa became involved in banking and insurance until his death in 1884. The house was purchased in 1917 by F. Clyde Keefe, a local attorney and twice mayor from 1934-35 and again from 1942-47. The home remained in the Keefe family for three generations. The Thom Hindle Gallery at the Woodman (formerly the Keefe House Gallery at the Woodman) is New Hampshire’s newest professional Fine Art gallery, is located in the beautifully preserved Victorian Era home at 15 Summer Street in Dover, NH. There is no admission charge to visit the Thom Hindle Gallery at the Woodman Museum. Learn about the current exhibition on view at the Thom Hindle Gallery at the Woodman here. The House is available for rental for small business meetings, retreats, or corporate events. The building is equipped with a serviceable kitchen, large dining area, open rooms and limited seating for lectures. Rental costs range in price. For more information, contact director@woodmanmuseum.org. 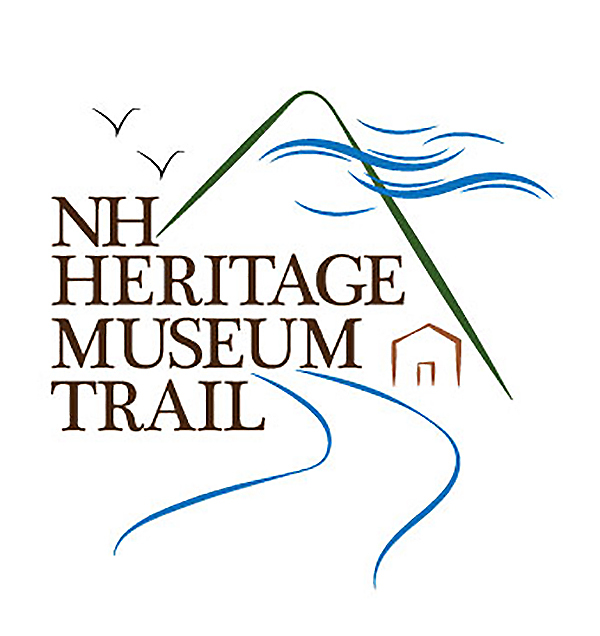 Preserved in a controlled environment are more than 7,000 historical and genealogical documents, including a will dating back to 1741, city records from 1732-1800, 100-year old school records, and a 1771 tax bill from King George.